This month, The Art of the Business focuses on how blogging can help market your work as an artist. 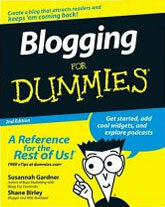 I interview Shane Birley and Susannah Gardener, authours of Blogging for Dummies, The Second Edition. Please note, there is no introduction to this podcast, we simply get right into it. And it ends--well, you'll see. -------------------------------------------------------------------------------------------------------------------------- Special thanks to Shane Birley and Susanah Gardner. Blogging for Dummes, the Second Edition, is available widely in bookstores, and I highly recommend it as an informative, but easy read. Special Thanks also to Dave "the sound guy" Rankin.